It’s been a long time since the Space Shuttle last flew. STS 135 touched down July 21st 2011 – the last time the USA had the capability to send humans into the harsh environments of space, the only arguable exception being the nation’s sizeable role in the International Space Station. It has been even longer since the final flight of the Apollo missions. Apollo 17, touching down December 19th 1972[i], is seen by many as the predecessor to the Orion design. The Orion crew module is designed for up to six crew members and is to perform a range of tasks necessary for human survival. The missions targeted are extended missions in low Earth orbit (LEO) and, in the future, planned missions to asteroids and potentially Mars. 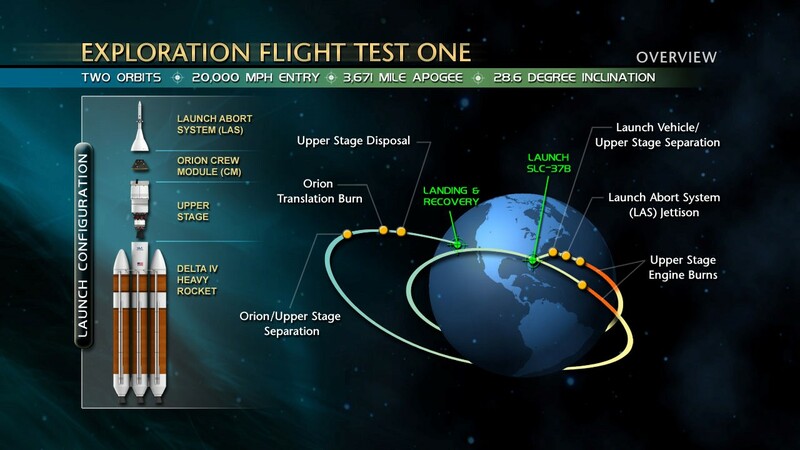 Exploration Flight Test-1 Overview (Credits: NASA). December the 4th, all things going well, will see the first uncrewed launch of Orion atop a Delta IV heavy. This “Orion Flight Test” or “Exploration Flight Test-1 (EFT-1)” will be a brief four hour flight, intended to test safety critical aspects of the craft. The mission is designed to put spacecraft systems through their paces, verifying the structural integrity of the vehicle during launch and its space worthiness in a vacuum immediately after launch. While only performing two orbits, the craft will be boosted by two Delta IV upper stage burns to significantly raise the apogee of Orion. Prior to reentry the craft will have to deal with some of the harshest environments in near-Earth space: the Van Allen belts. One of the key additions to the overall design in comparison to the space shuttle missions and to the Apollo missions is the developments of the Launch Abort System – LAS. This system sits atop Orion at the very top of the launch assembly. In the eventuality of a malfunction in the rocket during launch, the LAS is designed to pull Orion from harm’s way. This addresses a safety issues with the Space Shuttle, which missed a crew escape system. The Launch Abort System being integrated to the Orion (Credits: NASA). 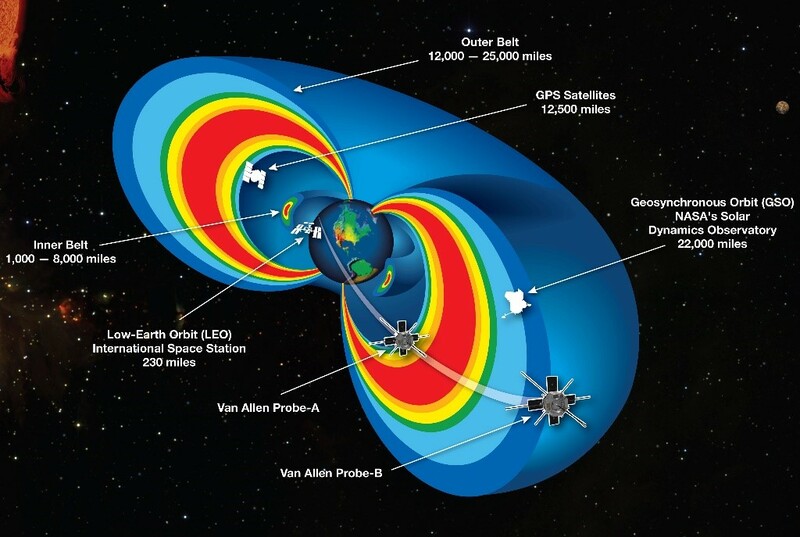 The Van Allen belts represent a significant radiation hazard to onboard systems and to organic life in space. ETF-1 will pass through the inner radiation belt which contains a mixture of high energy electrons and protons. Throughout the craft, radiation meters (dosimeters) will record a sector analysis of the radiation environment within the vehicle, in order to assess the performance of the shielding. This mission will take maximum advantage of the passage through the Van Allen belts by in inclusion of a specially designed payload for this mission. As part of a NASA initiative, the Exploration Design Challenge, a group of students from the Governor’s School for Science and Technology in Virginia have developed ARES. ARES, American Radiation Eradication in Space, is designed to experiment on multiple different types of radiation shielding including a combination of material types: heavy metals to block gamma radiation and hydrocarbons to absorb neutron and particle radiation. The Van Allen Belts (Credits: NASA). The raising of the apogee of the craft yields another benefit than allowing passage through the Van Allen belts: it is needed in to achieve a velocity of approximately 8.9 km/s upon reentry. This is comparable to the velocities that the Apollo missions experienced upon reentry, approximately 11 km/s, and represents a serious test of the ablative heat shield system. The heat shield is the largest of its kind ever made and relies on onboard processing to fire thrusters to maintain alignment of the craft during reentry. The shape of Orion being so similar to that of the Apollo craft is no accident; the engineering solution is tightly bound to the Apollo missions in order to be able to utilize flight data on reentry from the Apollo series. Orion’s parachutes will be put to the test after the craft’s first reentry. Parachutes are essential to the design of a reentry vehicle in order to allow the craft to survive the trials of high speed reentry; without them, the capsule’s terminal velocity in the atmosphere would be catastrophic to both itself and its crew. Parachutes slow the craft to acceptable velocities to make touchdown safe for the ground and craft alike. The Orion spacecraft features redundant parachutes to ensure safety. The parachutes deploy in stages, so as not to decelerate too rapidly. A rapid deceleration would represent a significant force on the crew and also the parachutes themselves. First two drogue parachutes deploy to slow the craft to 78m/s. At this velocity the three main parachutes deploy and open, eventually slowing the craft to a gentle 8.9m/s before splashdown in the ocean. This will not be the first test of the parachutes – they have already been tested after the Orion was dropped from an altitude of approximately 10.5km. This test was two-fold: firstly to test the parachute design and terminal velocity of the vehicle but also to test one of the parachutes in the event that the reefing stage of the deployment was skipped – a potential failure mode. 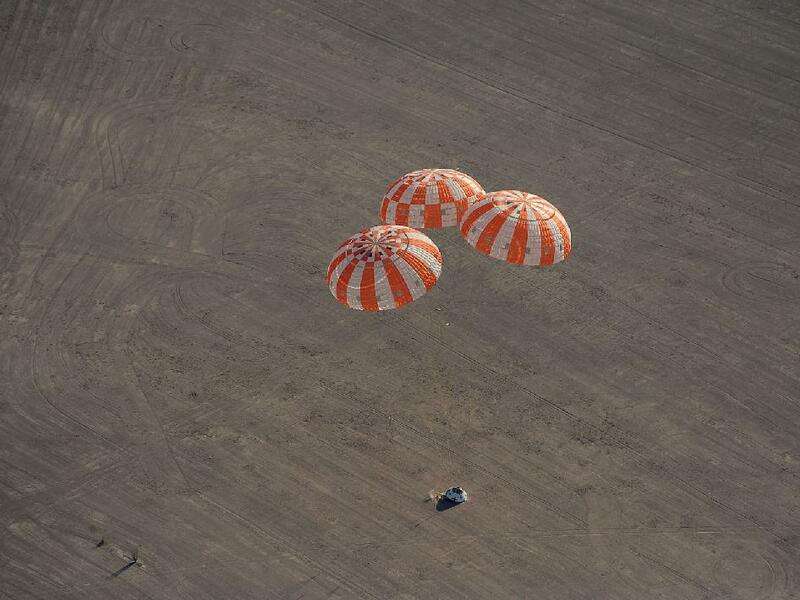 A July 2012 Orion drop test, using all three parachutes (Credits: NASA). The Orion Multi-Purpose Crew Vehicle (MPCV) falls under the Exploration Systems Development program within NASA. 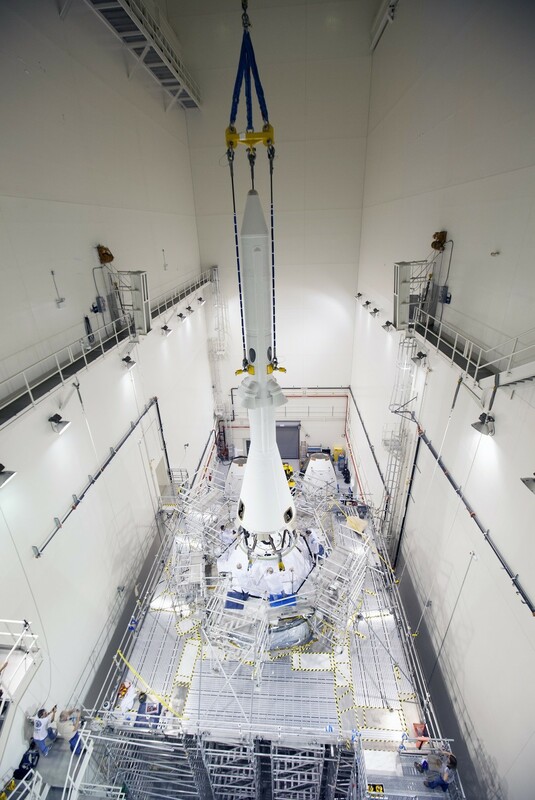 This program, in conjunction to the Orion development, is developing a new rocket known as the Space Launch System (SLS). This will be the rocket used to propel the Orion in the missions planned to follow EFT-1. The first three missions after EFT-1 are designated EM-1 and EM-2 with EM standing for Exploration Mission. EM-1 will use the SLS for the first time and will place the craft in a retrograde orbit about the Moon. The mission is intended to last a total of 25 days and will take the Orion craft further from the Earth than any other human spaceflight system to date. EM-2 is intended to follow the same trajectory as EM-1 but will also be crewed by up to four astronauts. EM-1 is scheduled for 2017 with EM-2 to follow a number of years after. December 4th is certainly a date for the diaries and, with a successful mission, will hopefully leave open the possibility that humans may travel past low Earth orbit this decade – for the first time since 1972. Lift-off is currently targeted at 7:05 EST or 12:05 UTC. Try to catch the launch and the coverage of the mission as it unfolds! Though Apollo spacecraft were used in subsequent LEO programs. Ian Stotesbury is a systems engineer with three years experience in space projects. His interest in space is far reaching, with a passion for future development of the industry. Ian has an MSc in Astronautics and Space Engineering from Cranfield University and an Astrophysics MSc from the University of Birmingham UK. Recently, Ian graduated from the ISU SSP14 in Montreal, Canada.